Kata pepatah, ‘Jika tidak dipecahkan ruyung, manakan dapat sagunya’; sesungguhnya sesuatu kejayaan, tidak akan dicapai tanpa usaha. Majlis pada pagi ini adalah majlis untuk meraikan satu kejayaan usaha. Bertempat di lantai tinggi MENARA PETRONAS yang ikonik, kisah gemilang daripada daerah Perak Tengah, sebuah daerah yang sekian lama dianggap terpinggir, diangkat namanya melalui sebuah penerbitan yang menghidupkan semula kegemilangan lama yang telah tertimbus; sebuah daerah yang penduduknya sekian lama dihukum, dengan menafikan mereka daripada program-program pembangunan, kerana dendam kemarahan Pemerintah Inggeris terhadap sikap patriotik penduduk di kawasan ini, menentang campur tangan Inggeris di dalam urusan pemerintahan negeri. Daerah Perak Tengah, yang sekian lama didiskriminasikan, hanya mula menikmati pembangunan yang lebih bermakna selepas tahun 1982, apabila Kerajaan Negeri Perak, dipimpin oleh seorang Menteri Besar yang berasal daripada Pasir Salak, ia itu Orang Kaya Kaya Seri Agar DiRaja, Dato’ Seri DiRaja Tan Sri Ramli bin Ngah Talib. Suntikan dana pembangunan yang lebih bermakna oleh Kerajaan Beta pasca 1982, telah berjaya mengubah landskap daerah Perak Tengah, lantas turut membantu mengubah nasib penduduk di daerah ini yang majoritinya terdiri daripada orang-orang Melayu, yang begitu lama menderita akibat ditindas secara halus. Landskap di daerah Perak Tengah telah berubah, bukan sekadar daripada komponen prasarana, malah melebarkan kepada aspek-aspek perkembangan sosiobudaya dan perkembangan intelek. Dua buah kampus institusi pengajian tinggi, Universiti Teknologi Mara (UiTM) dan Universiti Teknologi Petronas (UTP), terletak di Sri Iskandar di dalam daerah ini. Universiti Teknologi PETRONAS (UTP) bersama The New Straits Times Press (NSTP) telah merintis usaha, menghasilkan sebuah penerbitan berjudul ‘Perak Sultanate: The Historic Royal Glory of Perak Tengah’. Tersurat di dalam penerbitan ini, kisah dan sejarah, serta imbasan kegemilangan pemerintahan kesultanan Perak ketika berpusat di daerah Perak Tengah. Sebahagian besar daripada makam-makam Sultan terdahulu, terletak di daerah Perak Tengah. Makam-makam Diraja tersebut, tidak bertempat di satu lokasi, di sebaliknya bertaburan di beberapa kawasan di daerah ini, membisikkan kepada kita, akan keadaan dan cabaran yang dihadapi oleh Sultan, Kerajaan dan rakyat pada era tersebut. Bahawa Sultan, Kerajaan dan rakyat, perlu berpindah randah dari tempat ke tempat, membayangkan bahawa ketika itu, berlakunya sistem kehidupan agraria secara nomad dan budaya berkelana. Selain daripada faktor ekonomi dan faktor kesuburan tanah, berlakunya pemindahan pusat pemerintahan dari tempat ke tempat, turut mencerminkan, bahawa pemerintahan perlu bijak menangani pelbagai cabaran lain yang dihadapi, berbentuk alam sekitar, banjir, dan penyakit, begitu juga ancaman daripada seteru dan musuh. Pada peringkat awal mengasaskan negeri, para Sultan menghadapi pelbagai cabaran, dugaan dan ancaman, namun dengan segala kegigihan, azam dan tekad, para Sultan mengambil tanggungjawab, memberikan pimpinan dan payung naungan untuk kelestarian bangsanya. Pada hakikatnya, seorang Sultan itu, bukanlah dewata yang diturunkan daripada kayangan, disambut dengan hamparan, lalu didaulatkan di atas takhta sebagai Raja Pemerintah, tetapi seorang Sultan itu, sebelum dinobatkan sebagai Pemerintah Negeri, perlu terlebih dahulu mempamerkan sifat-sifat seorang pemimpin yang berwibawa, membuktikan daya juang, daya memimpin, daya menyatukan rakyat dan daya meneroka serta mempertahankan wilayah. ‘Perak Sultanate: The Historic Royal Glory of Perak Tengah’, is not only a delight to peruse, with its beautiful design and photographs, as befitting its regal subject matter, but the book is also a unique repository of some of the most striking aspects of our cultural heritage, and some of the important events that have shaped the Sultanate over its nearly half a millennium-long history. As Datuk Ir. Dr. Abdul Rahim Hashim, the then Vice Chancellor of UTP, sets out in his foreword, the ‘rich historical tapestry’ that is woven by the book, provides its readers with both ‘a greater understanding and appreciation of the past, and inspiration for the future’. It seems almost ironic that such an historically-focused publication should have been instigated by one of our most forward-looking and progressive universities. This shows the deep commitment of UTP to the important task of preserving the past and learning some of its lessons, as an essential part of preparing to meet the challenges of the future. As an historian myself, albeit more directly concerned with its economic aspects, I endorse this aspiration, and welcome the contribution of this book towards it. It is also commendable that a university that was established to pursue excellence and innovation in the realm of the sciences, is taking such an interest in supporting an endeavour that is so fully centred on the arts, in the form of the culture and history of our region and its monarchy. This publication of such an arts-focused book, by a science and technology-focused university, highlights the importance of balancing progress in the arena of science and technology on the one hand, with a deep grounding in the sphere of the arts and culture on the other. It is also encouraging to note that a private university, normally identified as a for-profit enterprise, has made the effort to back a project of this nature, as a service to the state and its people. This shows the noble intentions of UTP, in associating itself more closely with its surroundings, and investing in CSR initiatives locally. This effort is important, as it helps to give the people a clearer understanding and greater appreciation of their monarchy, and so of their heritage. This in turn will align them and strengthen their spirit with understanding of where they come from. The deep roots of the history and heritage of our region, and of Perak Tengah itself, are illuminated to great effect in the many stories and episodes which are recounted in the book, taking place over the centuries. 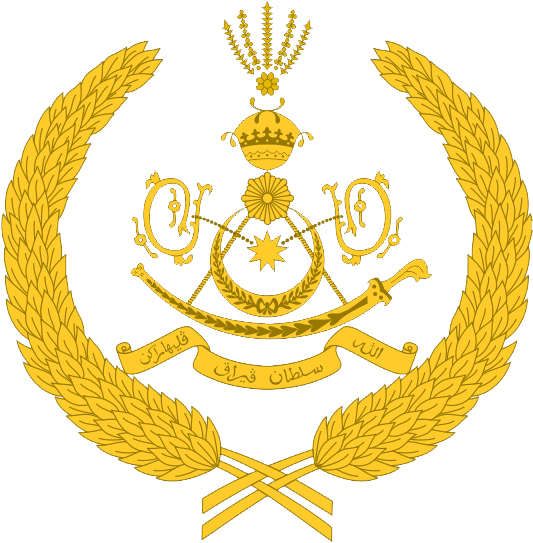 These accounts also help to highlight some important continuities with the past, despite the clear differences between the Sultanate in those days, and its role in modern day Malaysia. These continuities are evident in the many of the royal ceremonies and customs of the Sultanate itself, which have endured over the centuries. The traditions associated with the enthronement of a new Sultan, including the ‘Setting Foot’ ceremony, the legendary keris, Taming Sari and the legendary sword, Pedang Cura Simanja Kini, all pictured so stunningly in the book, have of course been passed down since the founding of the Sultanate in 1528. One key aspect of our culture that is featured in the book, is the richness of our architectural traditions, which can be seen as one of the hallmarks of the monarchy over its long history. I want to suggest to today’s architects, rising talents, and students, that you would do well to study closely our traditional forms of architecture, and particularly to appreciate how well-adapted they are to the local environment. This can be seen in design features such as stilts and pitched rooves, as well as in the widespread use of renewable materials, all examples of what we would now call eco- or environmentally-conscious design. We should seek ways to incorporate such features into our modern designs and developments, and collectively benefit from continuing the important legacy of our forebears in this area. The book also yields some interesting insights into important historical dynamics and the challenges faced by the Rulers, factors that contributed to decisions on moving the court and administrative centre from one place to another. Such challenges were faced continuously throughout our earlier history, and the sacrifices and decisions that were made in those days, have helped to pave the way for the stability and prosperity that we now enjoy. The earlier struggles of the Rulers, are perhaps sometimes taken for granted by the younger generation, who would do well to reflect on our tumultuous history, and on the ways in which it has shaped the present. The political and economic challenges that the book reveals, along with the enduring cultural traditions that it illuminates, all form part of the deep roots of our shared history, and have all contributed to making our state, its citizens, and the Perak sultanate, what they are today. Part of the book’s success lies in conveying just how important it is to understand the longer-term patterns of trade and exchange, competition and conflict, that have contributed to our progress. The combination of these historical insights with the renewed appreciation of our immense cultural wealth that is inspired by this beautiful edition, is a most laudable achievement. So in closing, I want to strongly recommend the book to all, to learn from the insights it provides, and to enjoy our delightful cultural heritage that it depicts so beautifully. Beta amat menghargai usaha memecahkan ruyung yang telah dirintis secara bersama oleh sebuah institusi pengajian tinggi bersama sebuah akhbar harian, dan turut melibatkan para sejarawan dan Orang-orang Besar Istana Perak untuk menghasilkan penerbitan ini. Semoga kerjasama yang berjaya dijalinkan oleh istana, universiti dan media dapat diperkembangkan dan dipertingkatkan untuk menghasilkan bahan-bahan sejarah, dalam hasrat dan usaha mengilmukan generasi masyarakat semasa, terutama generasi muda, agar dapat menghargai tradisi dan memulihara tradisi ketika mengharungi gelombang modenisasi. Beta zahirkan ucapan terima kasih kepada semua pihak yang telah menjayakan penerbitan ini. Dengan lafaz Bismillahi Rahmani Rahim, Beta melancarkan ‘Perak Sultanate: The Historic Royal Glory of Perak Tengah’. Panuti H.M.Sudjiman, Adat Raja-Raja Melayu, (Jakarta: Universitas Indonesia Press 1983)133, di petik daripada Wan Ahmad Fauzi Wan Husain, Kedaulatan Raja-Raja Melayu; Jurispruden, Governan & Prinsip Perlembagaan Persekutuan, (Selangor: Abad Sinergi Sdn.Bhd., 2018), 117.